The United States Semiquincentennial Commission, established in July 2016, is tasked with facilitating nationwide plans to observe our nation’s 250th anniversary in 2026. Over the next eight years, this body will play a central role in shaping the anniversary narrative on a national level. Eight members of Congress, 16 private citizens and 9 federal officials, including the Secretary of State, Librarian of Congress and Archivist of the United States, comprise the committee roster. I was honored to be appointed as a Commissioner by Speaker Paul Ryan in 2017 and delighted to represent DAR. Convening in Philadelphia, the group enjoyed a private tour of the Museum of the American Revolution the afternoon of November 15, 2018, where we were greeted by Scott Stephenson, President and CEO and Claudia Stowers, Vice President for Advancement and DAR member. Following a wonderful tour, we adjourned to a reception room for a toast to the Commission. That evening the Commission hosted an elegant cocktail reception and dinner at the historic Union League of Philadelphia. Dr. Libby H. McConnell, Chief Historian Emeritus at The History Channel and a member of the U.S. World War One Centennial Commission, shared some of the lessons the Commission learned as they planned the commemoration. During dinner I was seated between two very interesting gentlemen, Dr. David Skorton, Secretary of the Smithsonian Institution and the Honorable Noel L. Hillman, United States District Judge from New Jersey. Judge Hillman told me his grandfather had been on the faculty at Berry College (which is one of the DAR’s supported schools) and his father was the Valedictorian. Judge Hillman proudly displays Bartlett’s Familiar Quotations in his chambers, a gift to his father from Berry College founder and DAR member, Martha Berry. 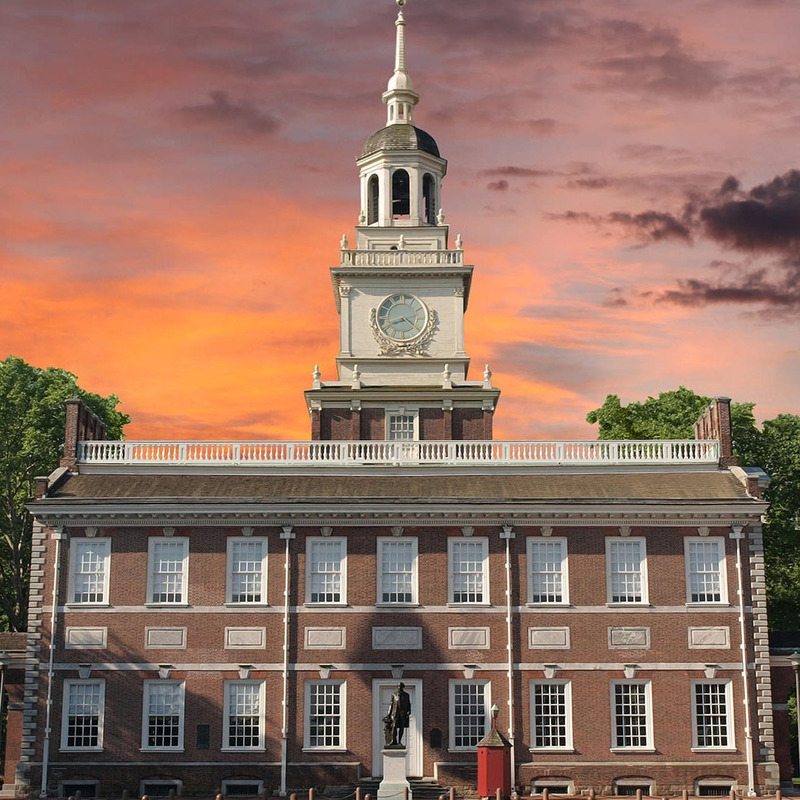 The next morning we traveled the short distance to Independence Hall. We were greeted by a quartet from the Philly Pops and each Commissioner was invited to sign Independence Hall’s VIP guest book. After posing for a group photo on the steps, we were invited inside where Park Superintendent Cynthia MacLeod gave a tour of Independence Hall, expressing appreciation to DAR for providing period furnishings for the Governor’s Council Chamber as a Bicentennial gift to the nation. The formal swearing in of the Commission was conducted by Judge Hillman in the Bell Tower in which the Liberty Bell remained until the 1850s. My heart was full as I thought about the great people who debated in that building and the responsibility we all have to remember their service and sacrifice. As we left the building, the Philly Pops quartet were again playing as we were seated on the plaza. A Thomas Jefferson reenactor read the Declaration of Independence and a George Washington reenactor reminded us that “With a firm reliance on the protection of divine providence, we mutually pledge to each other our lives, our fortunes and our sacred honor.” After an enthusiastic “Hip, Hip Huzzah!” we walked across the street to the Liberty Plaza for our meeting. The American Battlefield Trust, appointed by the Secretary of the Interior as the Non-Profit Partner of the Commission, had arranged a large U-shaped conference table where each seat had a name plate, a microphone and a very large binder, including press releases from DAR about the gift of 76 trees in 2017 and the DAR Pathway of the Patriots. The perimeter of the room was lined with support staff. Chairman Dan DiLella appointed four officers, including yours truly as the Commission Secretary and Chair of the Governance Committee. My responsibilities include complying with the Federal rules regarding Congressional Commissions and sending an annual report to Congress. Several presentations were given and we discussed the immediate challenge as no funds were allocated for Commission expense by Congress. After several hours discussing procedural issues, the meeting was adjourned. The exciting news is the Commission will have a gathering in March at DAR Headquarters. I am eager to share our beautiful building with these Commissioners. DAR members are encouraged to provide feedback and ideas for ways the nation can celebrate our 250th anniversary. If you have suggestions or questions for the U.S. Semiquincentennial Commission as they develop plans, please email America250@nsdar.org. #TBT 125 years ago, on April 19, 1894, the Sequoia Chapter in San Francisco, California, planted a �... 18 hours 13 min ago.